Respect your servers, people. Not just while they are serving you. Respect them when you meet them at a party, when you see them at the gym, and especially when they apply to work for you. If you are asking “why?”, first… human decency. Respect everyone, please. But secondly, servers do amazing work in a high-pressure environment for hours on end. And they do it with a big, toothy smile on their face. I’ve outlined the exact skills servers bring to the table (pun not originally intended but now that I see it, I love it). For context, I’ve also illustrated some non-serving examples of each of these skills that may or may not come from my own life experience. Side note: Personally, I’ve never been a server (though I worked in a hotel for five years so I’m no stranger to demanding, impatient customers), and to help me paint the picture, I solicited the assistance of the person who I’ve spent the most time with in my entire life, my dear sister, Michelle Langstaff. Michelle is a long-time server, turned Kinesiologist, and she has bailed me out of more near tragedies than I’m able to count. Thanks, brosif. Multitasking in everyday life: Scrolling Instagram with Gilmore Girls on in the background. Multitasking in the average workplace: Checking your email while pretending to pay attention in a meeting that absolutely could have been replaced by at 3 minute phone call. Multitasking for a server: You’re speed walking through a minefield of moving food and beverage to greet each new table within 30 seconds of their arrival (a strict restaurant policy). As you’re taking your first table’s drink orders, you notice another table walk in. You quickly punch in the first table’s drink orders and then sprint (without looking like you’re sprinting) to the new table to meet your next 30 second deadline. Just as you’ve punched in the second table's drink orders and gone to deliver the drinks from the bar to your first table, you notice a third table sit down. Now you’ve got table one who wants to place their dinner orders but the clock is ticking on greeting table number three. I’m exhausted and we haven’t even taken everyone’s drink orders yet! Michelle went on to tell me all about setting the tables, running food, correcting mistakes, offering dessert, getting bills, cleaning spills, condiment fills, and a dozen other tasks that I was too overwhelmed to even write down. As someone with a lot of event planning experience, I liken this level of multitasking to running three complex events simultaneously, without ever being able to sit down. The thought is dizzying and it inspires great confidence in former servers to deliver when things get hectic. Emotional intelligence in everyday life: Telling your friend you’re sick when you bail on their birthday party so they won’t hate you. Emotional intelligence in the average workplace: Telling your boss that they’re being a doofus without forfeiting your ability to buy dog food… and human food. Emotional intelligence for a server: Your salary is determined by how much a random hungry person off the street likes you. There’s nothing to tell you what kind of a day that random person is having, how peppy or straight-to-the-point they’d like you to be, or any other factors that might influence their decision to tip you. Servers have a split second to gauge the emotional state of the table sitting down in front of them. Once they’ve determined the unwritten social rules that the customer has established, they’ve got to adapt their serving style instantly to please the customer. It’s either that or get a lousy tip. This kind of interpersonal awareness and adaptability are extremely valued in high-level corporate relationship building and change management projects. So let’s value them just as highly in our serving staff. Tip your damn servers, people! Team building in everyday life: Asking a stranger to watch your stuff while you go to the bathroom… the real-life equivalent of a trust fall. Team building in the average workplace: A half-day team retreat in a boardroom with a couch in it. 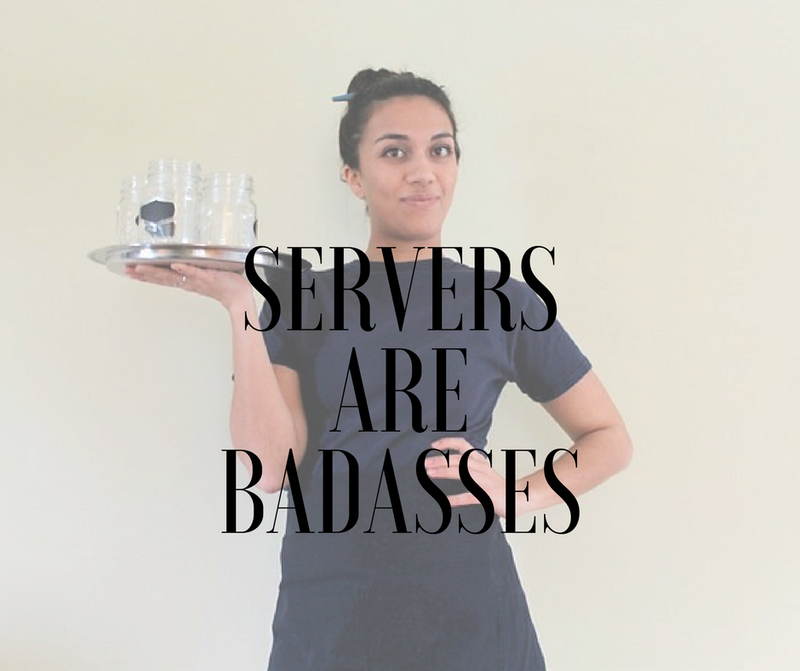 Team building for a server: Some of the other server experiences I wrote about had crossed my mind before, but Michelle opened my eyes to just how precarious the relationships a server needs to build among their team can be. As a server, you need the kitchen staff to have your back in case you need to change an order in a rush. You need strong communication with the hosts/hostesses to be aware when tables are being seated. And you need to have each other’s backs, constantly running food for each other, clearing each other’s tables, and mopping up each other’s spills. And it all happens so fast. There is no time to take a personality quiz and share your preferred confrontation approach. You are playing with live ammo and figuring out how to support each other as you go. This is the kind of attitude that is required to run a start-up or pilot project. Resilience in everyday life: Cooking up a nice healthy chicken breast when you reeeeaalllly want to order that gooey, cheesey, deep dish Dominos pizza with Brooklyn style pepperoni and garlic dipping sauce (sorry, I'm hungry). Resilience in the average workplace: “It’s Friday. It’s 2:30pm. I know the weekend is just a couple hours away, but I’m going to stay off Facebook and finish this report." Resilience for a Server: Your work uniform is a bit more revealing than you are comfortable with on this particular day. You have to spend 95% of your workday standing and walking. You don’t know if your shift is going to end at 10:00pm or 3:00am. As a server, you have learned to be comfortable with discomfort. Beyond the physical discomfort, there are also very uncomfortable human interactions. Servers will regularly muscle through customer complaints, inappropriate suggestive comments (often sexual and unwanted), drunken misconduct, and all-around entitled, impolite, unpleasant people. Obviously most people who visit restaurants are generally kind and considerate; however, even one or two of these interactions in a day is more than most of us are equipped to handle. Servers find a way to press on through all the challenges, all the uncertainty, and all the unpleasantness. When things get tough, a server will still get the job done. That is why I want former servers on my team. Some servers are amazing at their job and want to keep doing it forever and that is awesome! If you do ever have the good fortune to interview a server who is trying to get out of the restaurant game, give them a shot, will you? They’ve got a lot to offer. And if you are a server out there looking to make a change, don’t sell yourself short. You are amazing! If you want more of my opinions and also useful job search tips, discounts on services, and other fun, subscribe to my mailing list!